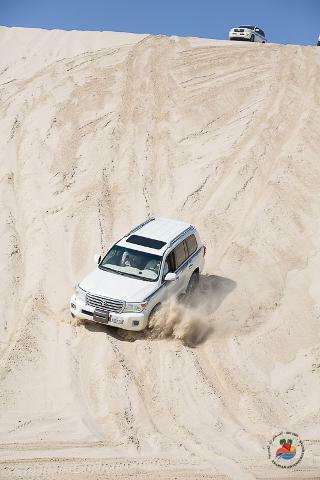 to make sure the vehicle is ready for the dune bashing, we abandon the boring tarmac for the exhilarating and breath-taking, roller-coaster drives across the desert, . The crossing of the desert is a real adventure in itself and an event to remember. You can decide on the kind of ride you want – fast and bumpy or a smooth and casual one. The drive will take you to the spectacular inland sea of Khor al-Udaid with its white sandy beaches and pristine, crystal clear water near the Qatar-Saudi Arabian border. There will be two stops during the journey for picture taking sessions to help you keep the memories of your desert adventure alive. Stop at our unique, purpose-built Arabian Adventures Qatar Bedouin Camp near Khor Al-Udaid where you can enjoy a swim, sandboarding, a game of beach volleyball or simply end the day with a shisha (water pipe with flavoured tobacco) in hand while watching the sun setting into the desert sands. Later on in the evening, enjoy full barbecue meal with non-alcoholic beverages at our campsite while star gazing in the cool desert night and appreciating the beauty of our universe. 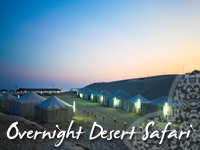 After a long day, retire into the night and savour the unique experience of sleeping in our Bedouin Camp. Breakfast is served the following morning before we embark on the journey back to the city. Shisha is available at Arabian Adventures Qatar Bedouin Camp for only QR40. Note: The tour is 16 hours including pick up and drop off. Payment by Cash on the day. Payment to be made directly to your tour guide at pick up time.